FINE PRINT: Pre-purchased tickets are non-refundable, but ARE transferable. 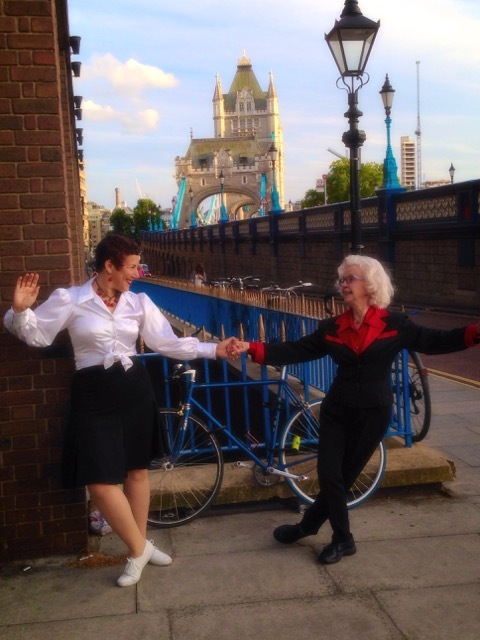 Won't you join me in celebrating the life of our true living legend of Lindy Hop, the lovely Jean Veloz. We've got a wonderful evening in store for you, and for her! We'll be holding the event at the historic Old Town Music Hall, a very intimate 1920s jewel box movie theater, one in which we can truly "embrace" Jean with our love. 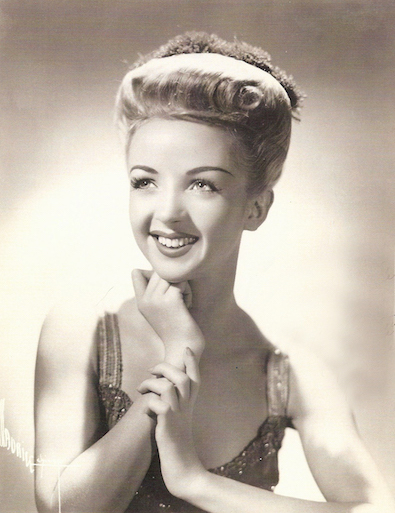 We'll be showing Jean's 1940s Hollywood dance clips, talking to her about her life dancing in the Swing Era, and then opening it up for a Q & A from you. And, of course, what would a party be without cake, so we'll have that too. Join us in celebrating the life of our special SoCal Lindy Hop Legend on her 95th birthday. Clips, Interview, Q & A, and CAKE! What can we say about Jean? She's a treasure. She's an idol. She's a delight. She's a friend to all on the swing dance scene. And, she's simply one of the most stylish swing dancers ever to lace up a pair of dance shoes. We all love her! Jean Phelps Veloz, the icon of the Hollywood-Style Lindy to new generations of swing dancers, provides a living bridge from the Los Angeles dance scene of the 1940's to the present-day Lindy Hop revival that has swept the United States and the rest of the world since the late 1990's. 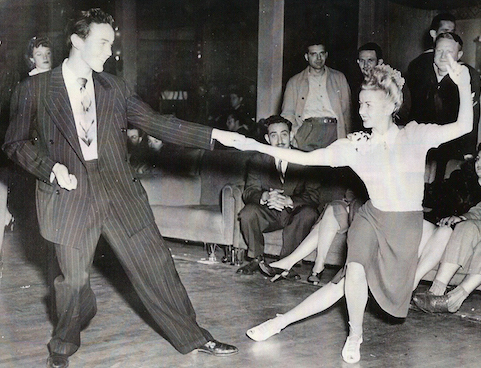 In the 1940s, Bbig Band swing music and the dances that went along with it, Jitterbug and Lindy Hop, became the driving passion of teenagers all over the country. Jean Phelps and her brothers, Bob and Ray, were no different. Every day they came home from school, invited friends over, and danced in the living room. Jean and Ray got so good together that they decided to enter an area-wide Jitterbug contest in Santa Maria, winning out over a total of 500 dancers. The Phelps family moved to Los Angeles in 1942, which allowed Jean and her brothers the opportunity to dance at the LA hotspots. In 1943 Jean entered a contest at American Legion Stadium in Hollywood, where the prize was a Screen Actor's Guild membership card and a dance cameo in the movie Swing Fever starring Kay Kyser and Marilyn Maxwell. Jean won the contest, her SAG card, and the opportunity to dance with Lennie Smith and Don Gallager in the feature-length movie. This opened the door to many other opportunities. In 1944 Jean made the well-known MGM film short Groovie Movie. Groovie Movie has become a favorite of swing dancers all over the world as they study this piece of history for the delicious look of this style of Lindy. Old Town Music Hall is a treasured cultural landmark located in El Segundo, California, not far from the Los Angeles International Airport. 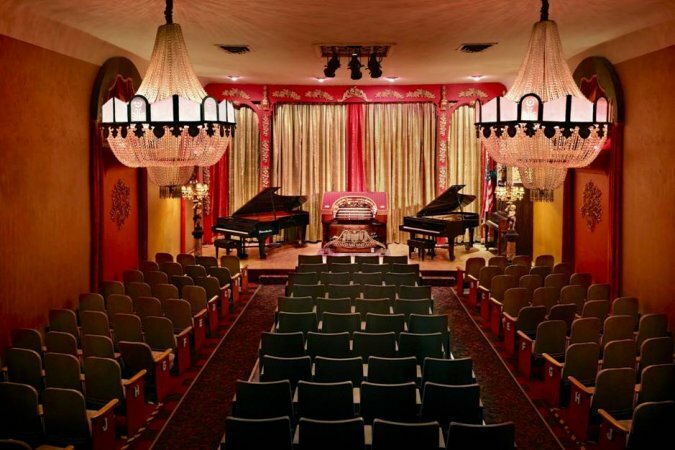 The Old Town Music Hall is on the site of the 1921 El Segundo State Theater, and since 1968, it has been home to vintage silent and sound films, and live concerts by some of the world's finest performers of jazz, ragtime, and popular music from the past. Silent films are accompanied by the Mighty Wurlitzer, a massive 1925 wind-powered pipe organ that has been meticulously preserved so that silent classics can be experienced with live musical accompaniment, just as they did when they were first shown. All ticket sale proceeds are going to the Old Town Music Hall, a 501(c)(3) non-profit organization, to continue their work on preserving the golden era of feature film and music. SEE YOU AT JEAN'S PARTY!